The draw rate has increased to 13/48 (27%). The top 7 places are looking good for qualification. There may be a battle for stage 2 qualification between Raptor, Texel, Bobcat, DisasterArea and Hannibal. There have been some website malfunctions causing archive and live viewing problems. We get these every season, sad but to be expected. Laser - Fizbo started with a small eval advantage for white, in a more or less stable position until move 56. With time running out and after a few exchanges Fizbo's eval climbed over 2.2 for black, but only temporarily. Fizbo exchanged a knight for three pawns but in the QRN vs QR endgame with connected passers could not get more than perpetual check. Laser's first score ! 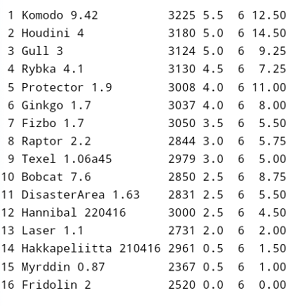 Hakkapeliitta is struggling although it has a rating close to 3000, probably because it is running on a single cpu and not taking advantage of the monster computer running TCEC. Playing against Ginkgo it tried to push a passing pawn but could not get enough protection for the queening square. When the effort was over Ginkgo's defense left it two pawns up, an easy win. Houdini beat Rybka in a B vs N endgame. Two champions of the past that can still play well. Protector's eval jumped to 'sure win' in an endgame against Raptor, when in fact it had a wrong colored bishop and a rook pawn. And it was using tablebases (only 5 men). Shame! Myrddin also had its first score in a draw against Laser. I don't think either has a chance to get to the next stage. Protector survived in a draw against Komodo, defending against Komodo can be frightening, so well done Protector. Texel seemed to be ahead in a closed position against Houdini. When the position opened up Texel chose to exchange two rooks for a queen, but it played the resulting QBB vs RRNN badly and Houdini was the winner in the end. DisasterArea - Texel reached a RRB vs QB endgame and for a long time appeared to be drawn with a small advantage for black. However, Texel under time pressure played inaccurately, and DisasterArea's eval started to jump. A mating threat forced Texel to exchange its queen for a bishop. It got a queen back through queening but the resulting RR vs Q with two white pawns was a 7-man tablebase for white, easy enough for both engines to recognize. This game was rather boring in terms of evals. Both engines thought the game was a draw with evals close to 0, and these are strong engines with a reliable position evaluation. However, the actual moves on the board were very exciting. Look at all the threats, pinned pieces and unguarded pieces, almost llike a theoretical chess problem. According to Cato this position was already seen a few years ago in a Houdini-Stockfish match. In any case, Houdini had three pawns as compensation for the knight, and the attack was over. The white pieces backed down carefully, allowing Ginkgo to regroup. Ginkgo then gave a bishop back for pawns but gained the initiative. Now it looked that black had threats on the king side. This attack was not effective either, resulting in a series of exchanges that left a RB vs RB endgame. The position became actually boring, and a draw was adjudicated shortly afterward. A good game that started with a bang and ended in a whimper.